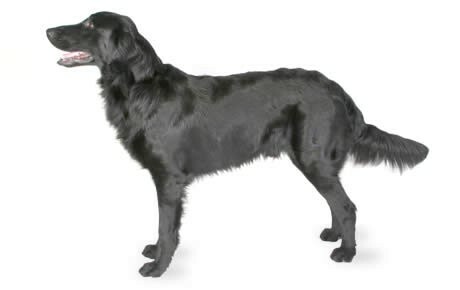 The Flat-Coated Retriever was developed during the 19th century from the same stock as Labrador Retrievers. Their lineage includes influences from Newfoundlands, Sheepdogs, Setters, and Water Spaniels. The Flat-Coated Retriever is an athletic breed that is prized as a family companion and gun dog. The breed was first recognized by the AKC in 1915 but almost died out by the end of World War II. Through a persistent revitalization program, the breed was brought back and has become increasingly popular since. Flat-Coated Retrievers are a cheerful breed that makes an excellent family companion, yet thrives when used as a gun dog. This breed is good-natured and playful and thrives on human interaction. The Flat-Coated Retriever should be trained and socialized from a young age. They are intelligent and eager to please, making them a joy to train. Flat-Coated Retrievers are a high-energy breed that needs a lot of exercise to be content. Ideally, owners will take their Flat-Coated Retriever on outdoor adventures on a regular basis. This breed will require vigorous daily exercise, and they love hiking, swimming, or jogging. Flat-Coated Retrievers live to be 8-10 years old. Flat-Coated Retrievers are currently the 89th most popular AKC registered breed. To thrive, a Flat-Coated Retriever must be fed a high-quality food source. Feeding requirements will vary greatly for this breed, depending on how active they are. Work with a veterinarian to find the ideal food source during your dog’s puppy growth period and adulthood that will help him achieve a long lifespan and healthy development. Flat-Coated Retrievers should be brushed on a weekly basis and bathed regularly. Are Flat-Coated Retrievers Good With Kids? Flat-Coated Retrievers are excellent companions for children. Due to their size, they should be supervised when playing with very young children. They are renowned as ideal family dogs. Gastric torsion in dogs, or bloat as it is commonly referred to, is a life-threatening condition that Flat-Coated Retrievers are prone towards. Gastric torsion is caused when food or gas is not excreted rapidly enough from the stomach, causing a buildup of pressure in the stomach. As this pressure increases, the stomach expands rapidly, placing pressure on surrounding blood vessels and the lungs and further limiting the excretion of waste to the intestines. Gastric torsion sometimes leads to a condition known as volvulus in dogs, which is when the stomach flips within the abdominal cavity. Signs of gastric torsion are pacing, attempting to vomit, abdominal swelling, and drooling. Gastric torsion is most often caused by overeating in a single meal, so be sure to avoid feeding your Flat-Coated Retriever one large meal throughout the day. Any sign of gastric torsion should be treated as a medical emergency. Hip dysplasia in dogs is a condition where the connection between the femur and pelvis in the hip assembly is excessively loose. The laxity in this connection causes the cartilage padding these bones to wear down unevenly, resulting in a buildup of scar tissue and eventually painful arthritis, bone spurs, and progressively worsening lameness. Glaucoma in dogs is a condition where fluid does not properly drain in the eye, causing pressure to build up. Glaucoma is a painful condition that is characterized by a physically enlarged eye. Other signs include excessive tearing and obvious pain. If left untreated, glaucoma can quickly lead to canine blindness. Patellar luxation in dogs is a condition where the kneecap, or patella, becomes easily dislocated from the groove it rides in on the femur. Patellar luxation is a painful condition that usually occurs spontaneously during or following exercise. Signs of patellar luxation are a sudden onset of lameness, shaking of a limb, limping, or a reluctance to place full weight on a limb. Patellar luxation should be treated by a veterinarian immediately.